A Mass of Christian Burial is scheduled for 10 a.m. Tuesday, Nov. 6, at Our Lady of Grace Catholic Church for Fabian “Chapo” Ochoa of Artesia. 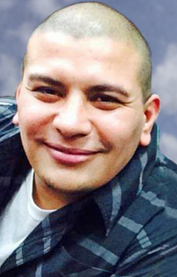 Ochoa, 35, passed away Saturday, Oct. 27, 2018, at Artesia General Hospital. Fr. Vijay will officiate the services, with interment to follow at Woodbine Cemetery. Pallbearers will be Chesarae Ochoa, Jeff Ochoa, Damian Ochoa, Chris Montes, David Baca, Mario Martinez, John Guajardo and Israel Valencia. Visitation will be held from 2-8 p.m. Monday at Terpening & Son Mortuary. A rosary will be recited at 9:30 a.m. Tuesday at Our Lady of Grace. Fabian was born Nov. 26, 1982, in Artesia to Guadalupe and Maria (Grado) Ochoa. He was a lifelong resident of Artesia. He enjoyed spending time with his kids and family. He liked making people laugh and had a smile that could light up a room. Survivors include his parents, Guadalupe Ochoa and Maria Grado of Artesia; brothers Anjel, Julian and Santos Ochoa, all of Artesia; twin sister Vanessa Madrid and husband Miguel of Artesia; children Jakobe and Brooke Ochoa of Roswell, and Jayvian and Mi’Reyah Ochoa and stepson Ayden Howard, all of Artesia; and numerous aunts, uncles, cousins, nieces and nephews. He was preceded in death by maternal grandparents Petra and Santiago Grado; paternal grandparents Julian Sr. and Delfina Ochoa; brother Christopher Peyton; and numerous uncles and cousins.